Planting of beans not only diversifies the diet, but also improves the food and nutritional security of families; and even it may be another source of income in the future when marketing surpluses. Of all the grain legumes, beans are the most important for human consumption. According to FAO, 129 countries on five continents reported bean production and Latin America is the area of greatest production and consumption, with more than 45% of world production. Beans are considered one of the staples of the rural economy (Fenalce, 2010). Beans are considered to be one of the main sources of protein, especially for low-income populations and a critical crop for food security in rural areas. The protein content varies according to the genotype; In general, is 24%, surpassing maize and potatoes in quantity and quality. In addition, beans are rich in iron and are a good source of fiber and carbohydrates. (Fenalce, 2010). 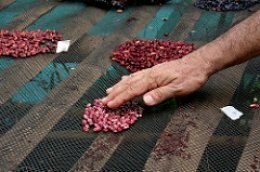 Therefore, it is not surprising that one of the measures of adaptation to climate variability and climate change prioritized in the Cauca Climate-Smart Village (CSV) in Colombia, is based on the motivation of local producers to produce and consume beans on their farms. These farmers traditionally plant coffee and sugarcane, which means that the planting of beans for self-consumption not only diversifies their diet, but also improves the food and nutrition security of their families; And even in the future, it may be another source of income when marketing surpluses. Learn more about the Cauca CSV. At the end of 2015, the CIAT Experimental Center, located in the Santa Rosa village of Popayan, Cauca, received the visit of 30 farmers from the Cauca CSV who learned about the practices of planting and management of bean crop, In addition to receiving different varieties of seeds. This motivated the farmers to plant and test these varieties. On March 16, 2016, CIAT's bean expert Carlos Jara visited two of the farms where farmers planted beans, making management recommendations and encouraging farmers to continue the process. To date, two sowings have already been carried out, where the farmers consumed the whole production but leaving enough seed to sow again. With the support of Professor Consuelo Montes of the University of Cauca, who has extensive experience in beans by having worked in CIAT for more than 10 years in plant breeding, it is agreed to carry out a research that allows the participatory comparation of CIAT bean varieties and bean varieties selected by farmers in the municipality of Timbío (Cauca). This selection, as a result of a previous research done by professor Montes. For this, two Masters' interns have joined the project. The sites to evaluate were selected both Timbío and the CSV, and approximately 20 bean varieties were preselected. The research is currently underway. 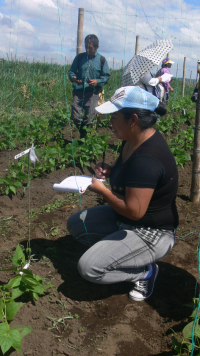 A farm school (Escuela de Campo, ECA in Spanish) was set up for teaching adaptation measures with emphasis on bean production with organic practices, diet diversification, proper seed management and distribution, thus allowing CSV's bean farmers will teach other communities: the farm used for the evaluation of varieties will be constituted as an ECA for learning in bean production, where researchers from the University of Cauca will guide the trainings as the crop is implemented and developed. The topics to be discussed in ECA are: conversations with farmers about their experience in the production of beans, practices on field preparation, fertilization and preparation of organic fertilizers, pest and disease management according to the stage of cultivation with slurry, harvesting, post harvesting, selection of seeds and consumption (cook recipes). The final phase of the project involves production on a commercial scale on farms as an alternative source of income, and based on the experience of previous phases, allowing them to have surplus production. 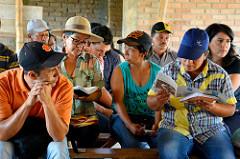 Next steps include a discussion with farmers about their experience with the varieties delivered by CIAT. Organic purine will be prepared to combat fungi and soil samples will be taken on the experimental farms, and the date of preparation of the land for the next planting will be scheduled. Liliana Paz is ecologist and is finishing her doctoral studies in environmental sciences at the Universidad del Cauca in Colombia. She is the executive director of the Ecohabitats Foundation. José Luis Urrea is Communications Officer of CCAFS Latin America. With inputs from Luis Alfonso Ortega, coordinator of protected areas and climate change of the Ecohabitats Foundation, and leader of the Cauca CSV.